President Obama speaks during Monday's awards dinner for Syracuse University's Toner Prize for Excellence in Political Reporting at the Andrew W. Mellon Auditorium in Washington. 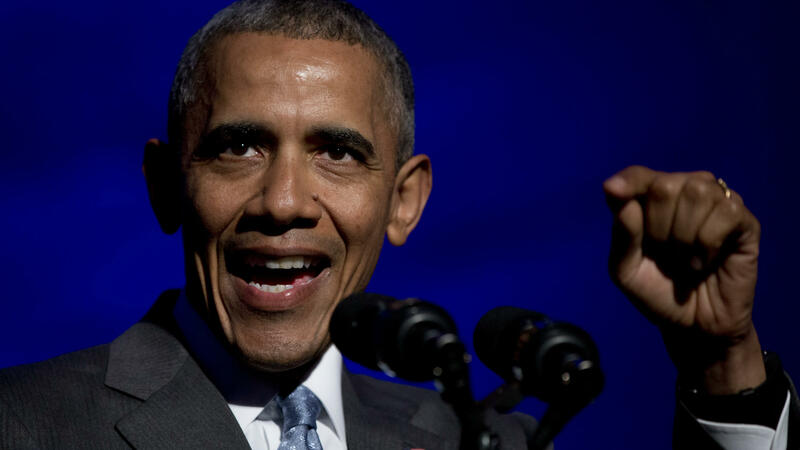 President Obama delivered a stern rebuke to the media, for their role in the 2016 campaign and, as he sees it, not holding candidates accountable for "unworkable plans." "A job well done is about more than just handing someone a microphone," Obama said at a journalism award dinner in Washington Monday night. "It is to probe and to question and to dig deeper and to demand more. The electorate would be better served if that happened. It would be better served if billions of dollars in free media came with serious accountability. Especially when politicians issue unworkable plans or make promises they can't keep." Obama seemed to be alluding to Republican front-runner Donald Trump, who has benefited from lots of free airtime while others have had to spend millions to have their messages come across on television. While Trump has been pressed by interviewers in many settings, tough questions and fact-checking have made little, if any, difference with his voters. In fact, he has only seemed to benefit. "I know I'm not the only one who may be more than a little dismayed about what's happening on the campaign trail right now," Obama said. "The divisive and often vulgar rhetoric that's aimed at everybody, but often is focused on the vulnerable or women or minorities; the sometimes well-intentioned, but I think misguided, attempts to shut down that speech; the violent reaction that we see, as well as the deafening silence from too many of our leaders and the coarsening of the debate; the sense that facts don't matter, that they're not relevant, that what matters is how much attention you can generate; the sense that this is a game as opposed to the most precious gift our founders gave us, this collective enterprise of self-government." Obama's upbraiding of the press, however, comes against the backdrop of a press corps that has feuded at times with his own administration. His Justice Department has cracked down on reporters in an effort to prevent leaks; it also set a new record for withholding access to government files under the Freedom of Information Act (despite calling for a "new era of openness" on his first day in office); and photojournalists in 2013 from several major news organizations chastised the Obama administration for denying their "right to photograph or videotape the President while he is performing his official duties," instead relying on official photos shot by White House photographers. The Obama White House has also broken new ground on bypassing the traditional news media, choosing, in many instances, to do interviews with nontraditional, friendlier media — in an effort to reach specific demographics — over White House beat reporters. "I wouldn't call it a carnival atmosphere, because that implies fun." Of this year's presidential campaign, Obama said Monday night, "I wouldn't call it a carnival atmosphere, because that implies fun." The use of the word "carnival" recalled the time five years ago when Obama called out Trump as a "carnival barker" in response to the Trump-led, and now debunked, "birther" movement that questioned whether the president had been born in the United States. Last night, Obama continued, "We're not going to be able to solve our problems if we get distracted by sideshows and carnival barkers." That was an unmistakable reference to Trump. "Unlike you, Vladimir, I don't get to edit the piece." The president said he shares some blame for the current political climate — but not all of it — and that that climate is corroding American democracy and society. Obama also said that other countries are noticing. "The No. 1 question I'm getting as I travel around the world or talk to world leaders right now is, 'What is happening to America?' About our politics." He mentioned one specific world leader, Vladimir Putin. Obama recalled a conversation the two had about a recent Atlantic piece outlining the president's worldview. Obama said Putin told him he disagreed with some of the things said in the piece. Obama said he told Putin, "Some of the things that were shaped may not fully reflect all the nuance of my thoughts on the particular topic that President Putin was mentioning. ... But I pointed out to him, of course, that 'unlike you, Vladimir, I don't get to edit the piece before it's published.' "
The line drew applause and laughter. The president also noted that "unprecedented change" has affected journalism. "We've seen newsrooms close; the bottom line has shrunk; the news cycle has as well," Obama said. "And, all too often, there's enormous pressure on journalists to fill the void and feed the beast with instant commentary and Twitter rumors, and celebrity gossip and softer stories." But he also admonished the press against letting some forms of new media dictate coverage. "Ten, 20, 50 years from now, no one seeking to understand our age is going to be searching the tweets that got the most retweets or the posts that got the most likes," the president said, despite his White House's embracing new media to bypass the filter of the traditional news media. After Obama's remarks, Alec MacGillis of ProPublica, the recipient of last night's Toner Prize for Excellence in Political Reporting — who won for his work on the oil industry's secret influence in Alaska — mentioned the lack of FOIA access. The audience cheered, perhaps the most public critique the press corps could offer that night.